Disney are understandably obsessed with their animated classics, and obviously care little for their live action films, which include a number of very interesting fantasy, science fiction and horror titles. Thankfully Disney seem to be happy to license these titles out to third party companies, who are very willing to give gems like Return to Oz and Something Wicked This Way Comes a good home and the respect they deserve. Return to Oz is one the finest fantasy films made in the last thirty years, and yet is considered to be something of a failure. Too grim for it’s intended audience, and apparently too whimsical for older filmgoers, the movie has only a cult following to champion its considerable merits, which include terrific production design (closely based on original illustrations by John R. Neill), a fabulous score by David Shire and Oscar-nominated special effects, (including a lot of Claymation work by Will Vinton). 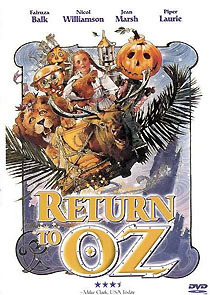 The film, based on elements from two of the Oz novels, Land of Oz and Ozma of Oz, finds Dorothy (Balk) in a dilapidated Emerald City ruled by the cruel Princess Mombi (Marsh) and the Nome King (Williamson). Anchor Bay’s disc presents the film in its theatrical ratio of 1.85:1 (sadly not 16:9-enhanced) and with a full Dolby Digital 5.1 sound mix (director Murch is perhaps better known as a very creative sound editor, whose credits include Francis Ford Coppola’s Apocalypse Now and George Lucas’ THX 1138). The film looks better than ever, despite a little dirt and dust, with vitally strong colour and sharp images. The disc contains a recent eleven-minute interview with Balk, who obviously has fond memories of making her first movie. Comparisons to the 1939 original are both inevitable and odious. As time passes the original film becomes increasingly archaic and saccharine, and it seems possible that the Harry Potter generation may find the 1985 sequel, with its feistier heroine and darker tone, more accessible. It’s a shame that Anchor Bay couldn’t have done something extraordinary with Something Wicked This Way Comes, a deeply flawed version of Ray Bradbury’s story that was undermined by studio meddling. 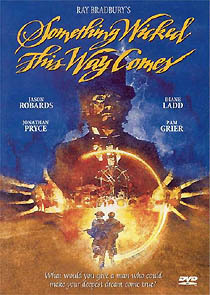 The film, directed by The Innocents’ Jack Clayton, was made in 1981, but wasn’t released until 1983, after Georges Delerue’s score had been replaced by one by wunderkind James Horner; Disney’s special effects department had pepped up the movie with worthless animated sparkle; and some jarring new scenes had been added. It’s regrettable that Anchor Bay wasn’t willing or able to include the commentary track that featured on the NTSC laserdisc, (which explained how Disney interfered with Ray Bradbury and Clayton’s original intentions), and, for that matter, that disc’s isolated score. Knowing Disney's archives are some of the best-maintained in the business, it's also a shame that none of the unused footage has been included (Anchor Bay later released another neglected Disney movie, The Watcher in the Woods, with this sort of footage, so it seems that the studio isn't adverse to opening its vaults). As it stands Something Wicked..., about a mysterious carnival that visits a small 1930s Illinois town, exposing the darkest desires of the local inhabitants, is an entertaining, but very Disneyfied, yarn. Anchor Bay must be credited for making the film more widely available, (and for a satisfying widescreen (1.66:1) presentation, with Digital 4.0 sound), but must realise that fans won’t be happy until they’re able to compare the theatrical version with Clayton’s original edit.